The Italian company Astra, founded by Mario Bertuzzi, produces dump trucks and other industrial vehicles. In 1946, the company began its activities with the conversion of army trucks left after the war into civilian trucks. With the move to new production areas in Piacenza, the production of own cars began, and in 1955 the first Italian all-wheel drive dumper Astra BM1 4x4 appeared. In recent years, the company has been engaged in the production of chassis, tractors and dump trucks on their base, as well as special dump trucks for work in quarries and coal mines. In 1986, Astra joined the IVECO concern (FIAT Group). 40% of Astra cars are sold in Italy and EU countries, 30% are exported and 30% are orders for the armed forces of the NATO bloc. The proprietary features of Astra cars include the multivariance of the design, very strong supporting frames, transmissions that provide a wide range of traction and dynamic characteristics, exceptionally reliable spring suspensions, as well as original cabs that provide high ergonomic performance. Since 2007, Astra cars are officially supplied to the Russian market. Updated in 2006, the family of HD8 trucks occupies a dominant position in the release program. The machines are specially designed for use in extremely difficult conditions, where the output parameters of the engine, power transmission, steering and structural reliability are critical. The consumer can choose the cars with the wheel formula 4x2, 4x4, 6x4, 6x6, 8x4, 8x6 and 8x8. As standard, cars can be operated at temperatures up to -40 ° C.
To work in a more severe climate, advanced electrical equipment, engine preheater, fuel and fuel filter heating, high-capacity storage batteries, autonomous air heater of the cabin, refined cooling system, frost-resistant materials are used. In the construction of the chassis of HD8 series trucks special highly elastic steel is used, which can withstand the heaviest loads. The geometric dimensions of the profile of the frame and the thickness of the sheet from which it is made are the most significant in its class of trucks. The reinforced springs and bridges, larger than those of competing cars, ground clearance, the presence of front and rear stabilizers of lateral stability - all this makes it possible to operate cars not only on a broken road, but also off-road. The use of specially engineered and customized Astra IVECO Cursor diesel engines makes it possible to achieve increased torque even at a crankshaft speed of 900-1000 rpm. The engines meet Euro-4 environmental standards (trucks with Euro-3 engines are supplied to Russia). Due to the optimized characteristics of the Cursor torque motors, trucks are characterized by reduced wear of the clutch. The use of a powerful motor brake allowed to increase the service life of brake pads. Stack-loplastikovaya cabin to increase the strength is equipped with a steel frame. The machines have a large glazing area, a well thought out interior, a highly adjustable seat with air suspension, an adjustable steering wheel, an informative instrument panel. Conveniently located controls, efficient power steering, high-performance ventilation and heating systems, good quality finishing materials - all this greatly facilitates the work of the driver. The improved aerodynamics of the cockpit and the refined engine cooling system reduce fuel consumption while driving at higher speeds. The four-axle Astra HD8 models with rear drive wheels or all-wheel drive are equipped with a modified 6-cylinder 13-liter IVECO Cursor 13 turbodiesel (F3B E0681 series) in various capacities of 320, 360, 400, 450 and 500 liters. from. With variable turbine geometry, and mechanical 16-speed gearboxes from ZF. Such power units allow machines to operate as part of a road train with a gross mass of up to 55 tons. Wheelbase - in the range from 3800 to 5100 mm. Machines are equipped with driving bridges with dual main gears and wheel gears. All-wheel drive versions use two-stage transfer boxes with a reduction gear. Increased cross-country ability is facilitated by interlocking and interaxle differentials, and a minimum ground clearance of 390 mm. To improve driving performance on a part of cars, if necessary, single-axle rear axle wheels are installed. The front and rear axles are connected to the frame using parabolic or semi-elliptical springs, supplemented by anti-roll bars. The brake system is equipped with an ABS. 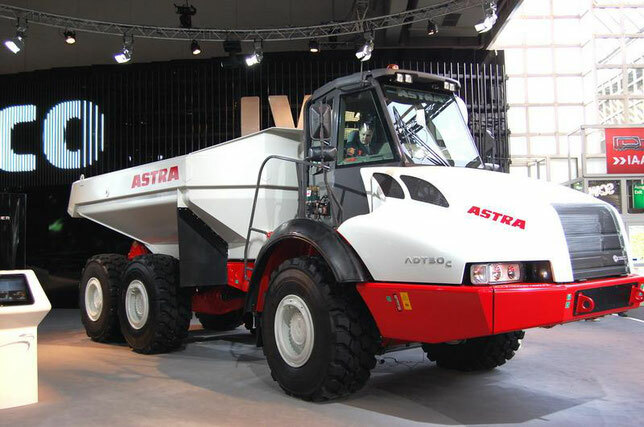 The total mass of single Astra HD8 cars with wheel formulas 6x4 and 6x6 reaches 40 tons, and road trains - up to 104 tons. Used engines of the IVECO Cursor 13 series develop power from 360 to 500 liters. S, gearboxes, transfer boxes (for all-wheel drive versions) and driving bridges are the same as on biaxial samples. The wheelbase range for truck tractors is 3200 and 3500 mm, in the chassis - from 3200 to 4500 mm. 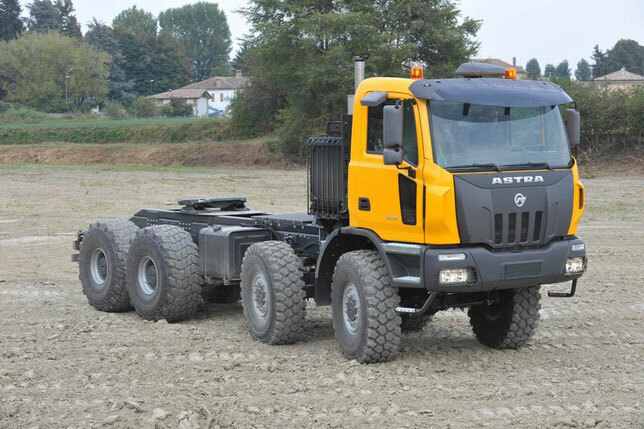 Four-axle trucks Astra series HD8 (8x4, 8x6 and 8x8) are produced only in the form of a chassis. The mounting frame length from 5930 to 7 880 mm makes it possible to place on it heavy-duty dump trucks of large capacity, as well as large-sized specialized superstructures for various purposes. The minimum power of the diesel IVECO Cursor 13 is 360 liters, the maximum - 540 liters. from. The total weight of a single truck reaches 50 tons, a road train - 104 tons. The company Astra has accumulated a solid experience in the creation of off-road dump trucks with various layout schemes. The design of ADT family machines with articulated frame, made on a single basic platform, provides for maximum unification within the type. The starting point was the three-axle (6x6) Astra ADT 25c, which transports 23.2 tons of cargo. Its more powerful counterpart ADT 30s is designed to carry 28.16 tons of cargo. They are followed by the samples ADT 35s and ADT 40s with load capacities of 31.5 and 36 tons, respectively. The first two cars are equipped with 10.3-liter turbodiesel IVECO Cursor 10F3A with a capacity of 319 and 353 liters. from. Under the hood of the larger ADT 35s and ADT 40s trucks, the IVECO Cursor 13F3A engine is available with a 12.8 liter working capacity of 402 and 456 liters. from. respectively. All cars are equipped with automatic hydro-mechanical transmission ZF with six front and three rear gears. Dumpers are equipped with wheel gears and self-locking differentials. The front continuous bridge is suspended from the frame by means of longitudinal levers and pneumatic hydraulic cylinders. Rear suspension - spring-balanced, with longitudinal guide rods. The braking system is a two-circuit, with disc mechanisms on all wheels. Astra RD The frame is assembled from stamped beams of rectangular cross-section, made of high-strength steel. A feature of the frame is the absence of welded joints. Change the direction of the car is due to the rotation of the front section, carrying the cabin and power unit, left or right to an angle of 45 °. The steering is equipped with a hydraulic booster. High off-road quality of the machine is ensured by the fact that both sections allow unlimited rotation of the front and rear parts of the car around the longitudinal axis. Such a design allows the drive wheels to maintain constant contact with the supporting surface. The spacious cab of ADT trucks has an expressive aesthetics and meets the requirements of safety rules for rollover and to protect the driver from falling objects (ROPS / FOPS). Particular attention is paid to ergonomics. For diagnostics and management of car systems, the instrument panel is equipped with a multifunction digital display connected to a multiplex data transmission system. It is possible to adjust the steering column for the angle of inclination and reach, as well as the position of the seat with air suspension. During the development of this series of articulated-articulated dump trucks, much attention was paid to reducing the maintenance time, as well as reducing the labor intensity of service activities. It is curious that in Europe dump trucks manufactured at the Astra plant are supplied both with their own logo, and with the emblems and in the colors of FIAT-Kobelco. In North America, truck-copies with the brand of Case are sent from Italy. A few years ago, the Astra company updated the family of off-road mining dump trucks. Now these models with the wheel formula 4x2, carrying capacity of 28 and 32 tons, have received designation accordingly RD 28с and RD 32с. As a structural material of the bearing frames of both samples, low-alloy high-strength steel is used, which withstands high dynamic loads. The longitudinal frame side members have a box section of variable height and are interconnected by powerful cross-members of the closed profile. In places of greatest stress, cast reinforcing elements are built into the structure of the frame. The dump trucks are equipped with IVECO Cursor 10F3A turbodiesel with a capacity of 353 liters. from. (For the RD 28c model) and 381 liters. from. (With the RD model 32c). The machines are equipped with hydromechanical transmission Allison, which includes a lockable torque converter and an automatic 6-speed planetary gearbox, which is switched under load. Control the transmission and make its diagnostics electronic devices. On the driving rear axle, the torque is transmitted via a spaced main gear with planetary gears built into the wheel hubs. The dump trucks use a suspension with pneumatic-hydraulic elastic elements and an integrated stiffness regulator. Front and rear brakes are disc brakes. The tire size is 16.00 R 25 and 18.00 R 25. The body of the dump truck with a powerful visor that meets the FOPS safety standard is made of high-strength Hardox steel.